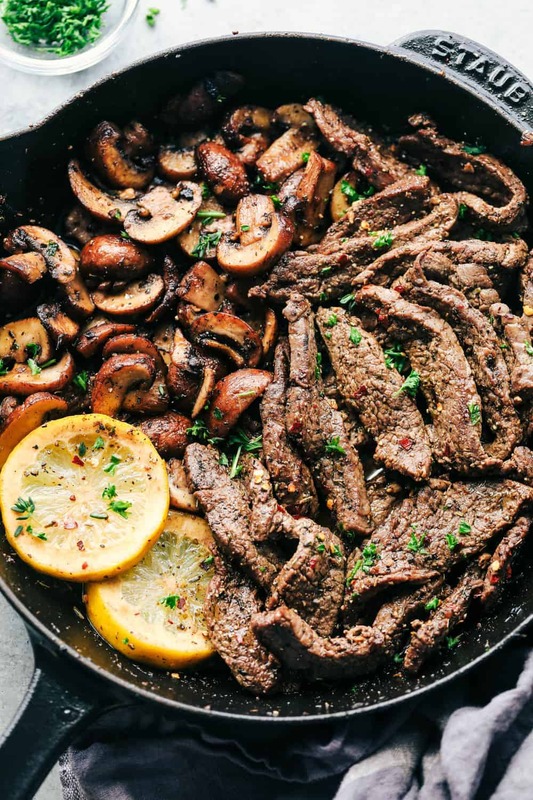 Lemon Garlic Butter Flank Steak with Mushrooms is an incredible and easy meal that is infused with such amazing lemon garlic butter flavor! It is cooked in a skillet to tender perfection and a meal that everyone will love! I just got home from an amazing conference this weekend in Texas. We had a blast while we were there and hit up all of the amazing BBQ places while we were there. The food was so good and worth standing in line for over an hour to get. Brisket, ribs, and all of the delicious meats were smoked to perfection. Texas has the best BBQ and I already want to take my hubby back! Right before I left for Texas, I made this skillet flank steak. OH MY GOSH! This was easily one of the most delicious steak that we have had. The flavor was seriously off of the charts. My keto loving husband couldn’t believe how good this turned out. So tender and the lemon garlic butter flavor is unforgettable! 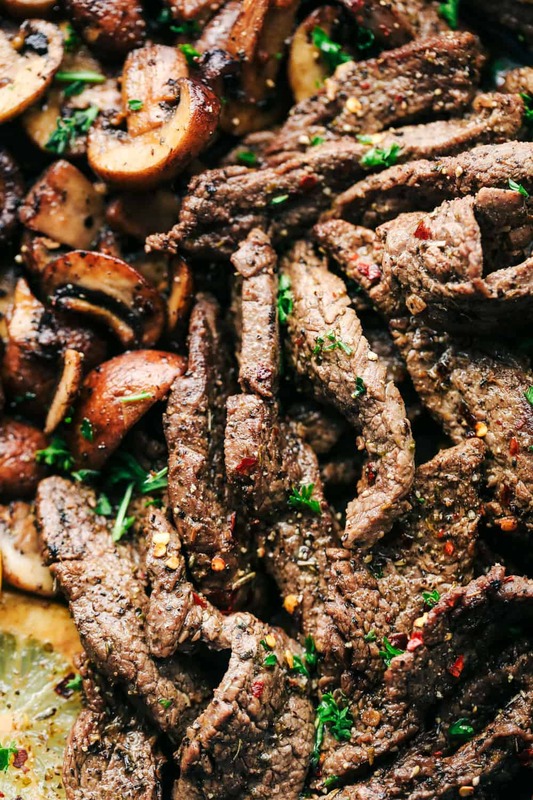 I marinade my flank steak before cooking and it is a total MUST! It helps to infuse the steak with amazing flavor and help to tenderize it before you cook it in the skillet. How long do you cook flank steak? Add some olive oil to your skillet and cook on each side for 3-4 minutes. You can cook the steak until medium rare. (130-135 degrees.) Let rest for 10 minutes and slice against the grain. How do you cut against the grain? It is not just the cut of meat that determines how tender it is, it is also how you cut it. Find the direction of the grain (which way the muscle fibers are aligned), then slice across the grain rather than parallel with it. 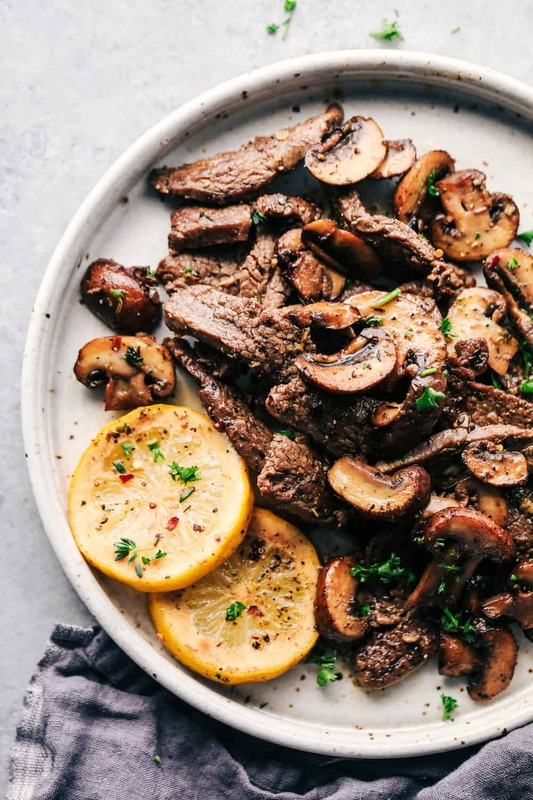 This meal comes together quickly and easily and is especially amazing topped with the lemon garlic butter mushrooms. It is the perfect pairing to this tender and juicy steak! Add the flank steak and the steak marinade to a zip lock bag and seal and let marinade for 30 minutes. Remove the steak from the marinade and discard marinade. Slice the steak into strips against the grain. Add the olive oil to a medium skillet and heat over medium-high heat. Add the steak strips and garlic and cook for about 2-3 minutes until the steak is cooked to desired liking. Remove the steak and set aside on a plate. 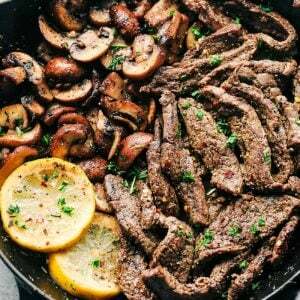 Add the mushrooms to the skillet and cook for 2-3 minutes or until tender. Remove and set on the plate with the steak. Add the butter, chicken broth, juice of one lemon and red pepper flakes to the skillet. Allow to simmer and add the steak and mushrooms back to the skillet. Toss to warm up and garnish with fresh herbs. Is it possible to have the nutrition facts listed with the recipes? So many of your recipes are wonderful! Also do you have many gluten free options. I made this for dinner tonight. It was a delicious success! Everyone, little kids included, loved the steak and mushrooms. Paired it with steamed broccoli and mashed potatoes. Definitely adding this to our menu in the future. Oh and the best steak marinade, is the BEST! Where is the recipe for the marinade?!? I totally messed this recipe up because I couldn’t find the marinade recipe. Then I saw someone else ask after the fact. Might help if the marinade recipe was here but was still pretty good.. Which fresh herbs do you use? Is there anything I could replace the mushrooms with? I would really like to cook this for my wife but she has an allergy to mushrooms. Worst case I could just leave them out. I made this last night and the whole family loved it! I also roasted some red-skinned potatoes then added them to the skillet in the end with the mushrooms, steak and sauce. Not a scrap left! We will be making this again for sure!